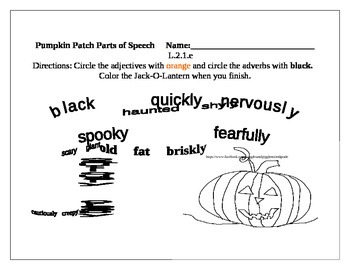 This product has a jolly Jack-O-Lantern to lure student into an activity where they will be required to determine if the Halloween themed words are adjectives or adverbs. When finished they may color the Jack-O-Lantern. You can have students use the words in a paragraph when they finish. Have them circle the nouns described by the adjectives, and draw a rectangle around the verbs described by the adverbs.